This serene oceanfront, ground-floor condo is located at the quiet north end of the quaint fishing village of Puerto Morelos, in the Mayan Caribbean. Enter the tropical garden courtyard of your Casita Blanca condo, with its wild orchids, birds of paradise, banana trees, and coconut palms. Your living room and private patio overlook the sparkling pool and the calm, turquoise ocean just steps away. Walk out the sliders onto the fine white sandy beach that is never hot, and into the warm sea, or head out in a sea-kayak. Lie in your hammock and dream, or sit on the lounge chairs under a palm-frond palapa and watch gentle waves breaking over the renowned Great Barrier Reef, which offers outstanding snorkeling, diving and kite-surfing opportunities. Go fishing or tour the reef in a glass-bottom boat. Take a guided tour of the jungle by ATV, take a zipline from treetop to treetop, and swim in the warm, clear cenotes. Walk along the beach to the local markets and excellent traditional Mexican and international restaurants at the town square. Visit the pier to see the fishing boats and the pelicans soaring in formation and diving into the sea for fish. Take a short drive along the coast to bustling Cancun or Playa Del Carmen, or venture to the magnificent Mayan ruins and many theme and zoological parks in the area. This bright, breezy unit offers one large bedroom with one queen-size bed with Sealy mattress and box spring, and two twin beds; plus a double futon in the living room for additional guests. The kitchen is fully equipped, and the living/dining room has WiFi for your convenience. There are ceiling fans and dual zone air-conditioning to keep you cool. The bathroom is decorated with Mexican Talavera tile. The rental managers speak English well and will graciously assist you. Drinking water included and maid service provided once each week. Entries to the complex, the unit, and the beach are ramped for wheelchair access; and the unit has a walk-in shower. Come experience the magic of this friendly fishing village hidden on the Caribbean coast, only 20 minutes from the Cancun airport. I live in upstate New York, in a Victorian house I saved from the wrecking ball, but haven't yet restored to its original glory, it's a work in progress, and some part of it always seems to be a work site. I rented this condo during a personal vacation 3 years ago, and fell in love with it. This is my first real estate venture outside the U.S. Located exactly a half mile north of the town square, the Casita Blanca condominium is an easy walk to restaurants and shops, yet quieter than downtown. My unit, B2, is located on the ground floor, and has an ocean view from the living room and patio. When I stay at my condo, I usually spend most of my time improving it, but I keep hoping there will be time to lie in the hammock on the patio and simply soak up the warm moist sea breeze and watch the pelicans. It's also fun haggling in my very basic Spanish with shopkeepers on the village square (sometimes my lack of language skills results in unplanned humor! ), snorkeling at the amazing reef, and taking day trips to nearby ancient ruins. On the village square, I always stop to say hi at Alma Libre, a most helpful bookstore run by Canadians; and at the Artesans' market and the women's jungle market, to buy traditional Mayan crafts from the artists who make them. A short drive or bus ride south takes me to a Mexican (Talavera) tile warehouse, where they are skilled at packing delicate hand-painted ceramics in underseat-sized boxes; and to the elegant seaside pedestrian mall in Playa del Carmen. My local rental managers can tell you the best way to get around. Step from the living room onto the patio, walk past the pool, and down the little ramp to the beach. For one car, but first come first served, no assigned spot. Living/dining room. There is no TV or DVD. Only cold running water in kitchen; bathroom of course has hot water. No dishwasher. Kitchen is minimal, not intended for serious cooking. Dozens of excellent restaurants are nearby. Dining table seating 4 is on one side of the living room. There is a small collection of paperbacks in the living room; feel free to take one or leave one. For those staying at the condo only. Our apartment is located on the beachfront in beautiful PO. The beach and palapas are to die for. Some of th best snorkeling in the world steps away. The apartment unit is decorated in mexican accent and is equipped with all amenities. We are truly amazed by the facilities. Would recommend this unit anytime. Great stay. We recently rented from Lauren at Casita Blanca. 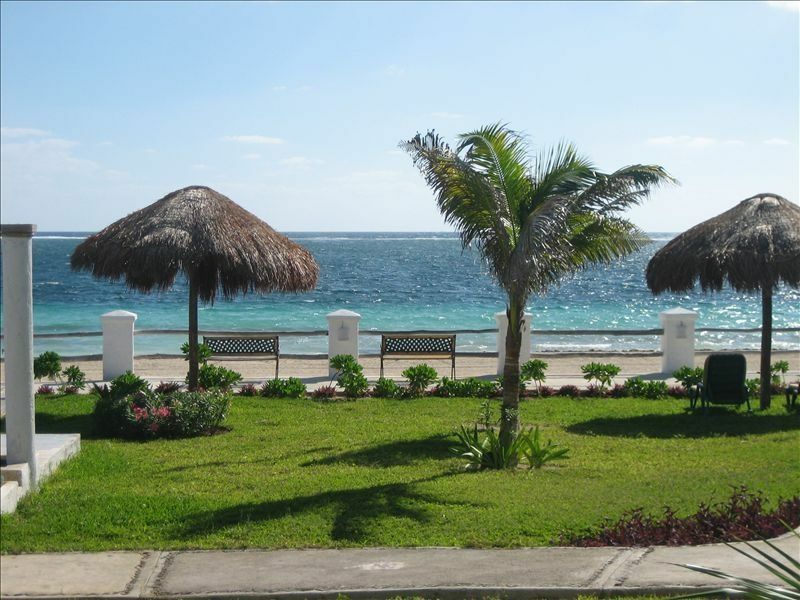 The condo is situated on the beach in beautiful Puerto Morelos. This one bedroom unit can easily sleep four and is equipped with all necessities. It is well decorared with the mexican accent . The owner was very helpful and responded to all our questions . I have chosen to return to this Unit next year and I will not hesitate to recommend to anyone interested. Perfect location! Right on the beach. Our condo was clean and the entire property was beautiful. Very pleased with the property overall! Glad you enjoyed your stay, come back to Paradise any time! We just spent our second two-week vacation at Lauren's charming condo and hope to return next year. The condo complex is beautifully landscaped and maintained, situated right on the beach, and is generally quiet, private and secluded. We usually walk or bike the mile from the condo to activities downtown. While the kitchen is small and lacks hot water like most beach condos, I cooked several Mexican-inspired meals there and found it quite adequate for our purposes. I heartily recommend this condo, assuming you're not looking for a luxury condo experience in which case you probably should stay at a resort. Lauren, if you ever want to sell, please let us know! It is perfect for our middle-aged, laid back, simple vacation style. We dropped our bags and opened the curtains to take in the view: sunshine, palm trees and blue water. Oh yeah. The condo was decorated with lots of local art and fabrics, kitchen had everything necessary to make a meal. A big jug of water on a stand.....Hallelujah! We don't have to lug 110# of water!!! (ok, just a bit of an exagration, but those dang bottles are heavy!) The whole place was immaculate, the towels were big lengths of thick terry, the shower had hot water, queen bed was quite comfortable. The grounds are immaculately kept by Cesar, he works constantly! Also, much appreciated, was the WIFI booster in the room. We had good service in the room and out on the patio when other residents were complaining of spotty service. We had a good time here and would come again. Thanks! Glad you had fun. Come back! Magnificent Mayan ruins in easy driving distance, zoological and amusement parks, Playa del Carmen and Cancun within easy driving distance.